The Commonwealth Summit has now ended. It was broadly seen as a complete disaster for both the Commonwealth and Sri Lanka.Only 27 of the 53 invited Heads of Government attended. 23 nations sent lesser representation (Antigua, Sierra Leone, Botswana, Canada, Mauritius, St Lucia, Malawi, Belize, Dominica, Jamaica, Cameroon, Kenya, Barbados, Mozambique, Trinidad and Tobago, St Vincent, Tuvalu, Uganda, India, Nigeria, Zambia, Ghana, and Papua New Guinea) and three didn’t attend at all (Grenada, Kiribati, and the Maldives – which is in the middle of its own constitutional crisis). 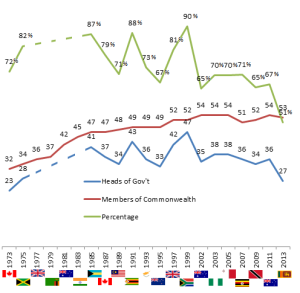 We have been unable to determine the level of attendance between 1977 and 1983 but as far as we are aware this was the lowest level of attendance recorded at a Commonwealth Summit since the first ever summit in 1973 – when the Commonwealth was a good deal smaller – and the lowest level of attendance in percentage terms by some considerable distance. Of those, three made it clear that their non attendance was a direct consequence of Sri Lanka’s failures with respect to human rights: India, Canada and Mauritius. India is, of course, a significant regional power, and home to more than half the Commonwealth’s population, whilst Canada provided almost a third of the Commonwealth’s funding, so these were big absences. But it was Mauritius that provided the most clear and moral political leadership throughout the Summit, and their principled decision to withdraw as host, and therefore Chair, of the Commonwealth in 2015 provided the highlight of the Summit. David Cameron did attend on behalf of the UK, but made a point of calling for an independent international investigation into war crimes committed in Sri Lanka, and of missing the opening ceremony to go to Jaffna. In sharp contrast the Prime Minister of Australia caused outrage by suggesting that torture was justifiable. Meanwhile the impact the summit had on the media was always going to be more important than the Summit itself. And here there was a resounding defeat for the Government – who shot themselves in the foot repeatedly with their constant attempts to silence activists in Jaffna and Colombo, their campaign of aggression against Channel 4, their exclusion of a UN special rapporteur, their intimidation of foreign diplomats and usually supine Commonwealth Charities, and their insults to the Tamil community. In addition to Channel 4’s exemplary coverage the summit also inspired fantastic journalism around the world with ITV, the Daily Telegraph, The Economist, the Indian Express, Defi Media, the Financial Times, Bahamas Weekly, the Sydney Morning Herald and the New York Times being particularly worthy of mention. Yet again the BBC was behind the curve. After putting out fantastic documentaries by Frances Harrison and Fergal Keane in the weeks before the summit, their TV output on Sri Lanka then almost entirely ceased, and they sent so few staff to Sri Lanka that Political Editor Nick Robinson was having to take his own photographs! Meanwhile, in addition to our media work we had been attempting to draw attention to the issue of sexual violence in Sri Lanka. We were therefore very pleased that the issue received such a high profile, that Mauritius prominently mentioned it as a reason why it was not sending its PM, that William Hague made a point of making it the first thing he mentioned when he landed, and that he used some very strong language. We were however disappointed that no action lay behind the words, and this is something we will continue to campaign for. For Sri Lanka this now means that this summit was not the public relations triumph the President was hoping, and indeed with Mauritius and the UK pushing for an independent international investigation into War Crimes allegations, he could be in for an interesting ride at the March Human Rights Council. Arguably we have never been closer to our goal of genuine investigation into the war crimes that took place in 2009 and, with any luck, that thought will be in the back of the mind of soldiers currently going door to door in northern Sri Lanka. However in the meantime the risk of retaliation against those that were so brave in speaking out and making this moment happen is very high indeed. The international community must help to keep them safe by not looking away at this crucial point. Meanwhile for the Commonwealth the future is very bleak, a fact for which they have no one to blame but themselves. 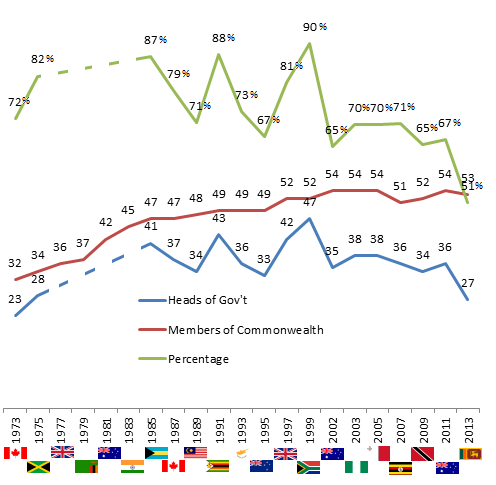 Aside from the lowest summit turnout in Commonwealth history they have lost a member (Gambia), a future host (Mauritius), potential funding (Canada), and a whole heap of credibility. On a more fundamental point, the sole hope for the Commonwealth’s future lay as a community of shared values, values that the Sri Lankan President has now shredded with his conduct as host and now chair. It must be said that some Commonwealth officials did try very hard to uphold the principles of openness and fairness, and earned the respect and thanks of journalists in so doing. But their conduct was overshadowed by that of the supine apologist for the Sri Lankan regime, Secretary General Kamalesh Sharma, the complete failure of the appropriate committee (CMAG) to act, and the lack of effective leadership from Heads of Government. For our part we have been overwhelmed with your response to our campaign on sexual violence – 2,500 signatures so far and counting – and with the impact it has had so far. But William Hague still has not deployed his team of experts to Sri Lanka, something he could easily do, and so our campaign will continue. Click here to take part. We will be talking to William Hague’s office in the weeks to come and will keep you updated of any progress. Meanwhile our appeal to help the victims of sexual violence has already received just under £2000. That is fantastic and will help purchase forensic assessments for at least the three most financially stricken of the 12 asylum seekers we are working with. The appeal is still open, and we would like to help more, so please click here to donate, if you can. A relaunch of our ethical tourism campaign, with much more up to date information from Sri Lanka. A long overdue piece on the need for a political solution in the north and east, and the ethnic aspects of human rights violations in Sri Lanka. An announcement regarding our new Council of Advisors, with an equally overdue increased Sri Lankan representation. A critique of decision making in the British Foreign Office. A relaunch of our volunteer programmes in the UK and Canada. And, once again, many many thanks for all the support you have shown us.